I’m glad you mentioned the countertops being budget. I was little surprised when I read the reveal and saw what you used. It’s okay for short term, but those aren’t kitchen counters, those are something you put in place until you can afford kitchen counters. Especially since Lowes now carries butcherblock(! ), which as someone who lives many, many hours from IKEA I’m very, very excited about. Yup, exactly right! Unfortunately butcherblock was special order at the stores we had at our disposal, so there just wasn’t time to change the plan…I tried! But the way I think about it is that these counters look good now, and it’s probably the easiest thing to change about the whole space. Butcherblock also isn’t everyone’s preference, so the homeowners can always live with these a while and then swap for something else entirely like a natural or composite stone, and then we didn’t waste perfectly good butcherblock! So good to know the Lowe’s butcher block is good stuff! I’ll be really curious what you end up doing in your own kitchen. I’ve come THIS CLOSE to doing butcher block counters a couple of times, but I’ve never been able to pull the trigger because I’m afraid of potential water issues around sinks — wood turning black, lots of maintenance I don’t have time for, etc. Keep us posted! I know, I worry about the same stuff! I’ve lived with butcherblock before and loved it, but never around a sink. Marble or soapstone would be the ultimate dream, but the price difference is obviously huge and I don’t know if I can swing it. But we’ll see—I’ve yet to really formalize a budget for the kitchen so many I can make it work. Wow. This is gorgeous! Simple and elegant. 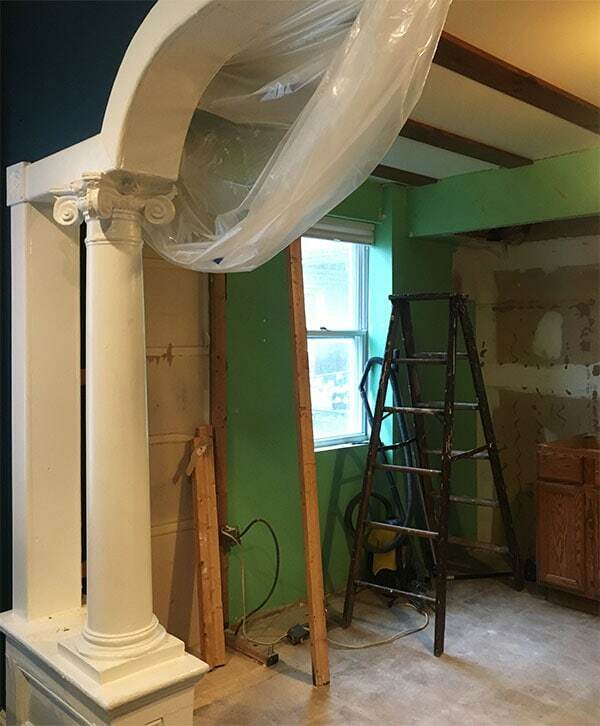 Yes, the columns absolutely had to stay, and yes to that ceiling! But for all the actual hard work, for me it’s those stools and that light over the island that really finish it off in style. Thanks Bonnie! The stools are Target and the light was just $119 at Lowe’s (Allen + Roth)! I hung it up myself and the quality is GREAT and the scale of it is so nice and substantial. The original plan was something else, but this light ended up being one of everyone’s favorite things in the space—and I think less than half the cost of what was originally planned! You don’t strike me as the kind of guy who sleeps for a week after this type of weekend, but hopefully, you got some down time. You’re a hero, the ceiling is my favorite part! OMG, OMG, OMG, I’m obsessed. Please come to Tulsa, all of you, and fix everything about my house in an incredibly short time span!!! That end result is nothing short of amazing! The ceiling looks AWESOME! So glad you saved #corinthiangoodness. The brick wall is just the right amount. The crown molding and the niche feel between the fridge and stove balance that wall so well and make for a nice view from the living room. Hmm that caulking tip is a good one, I always feel like I end up with the huge-glob-on-the-finger problem. I’ll have to try that next time! Sometimes the simplest, most obvious-seeming things are actually… not that obvious? OMG! This is just so incredible. I love this transformation. Great job, all of you! As much as I’d love for the crew to makeover a room in my house, I think we’d have more fun sitting on my patio drinking cocktails. So if y’all are ever in DC, invitation stands! DEAL! Although only 3 of us drink—more for us! haha! Holy smokes this is beautiful! 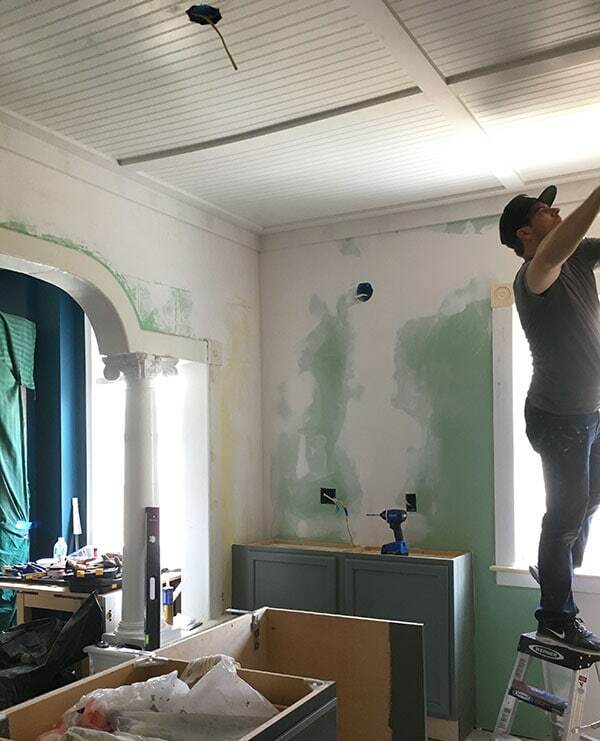 Your idea with the ceiling was so spot on–we see bead board ceilings + exposed brick in buildings here in Charleston all the time. The mix of textures and the natural light in this kitchen are so outstanding. Amazing work, y’all! Long time reader, never commented yet — just wanted to say that this kitchen is beautiful (enough that reading three reveals posts on different blogs didn’t even get boring — and I enjoyed reading your reveal most of all the three)! Wow good job all of you! That was damn risky to redo the ceiling but came out great and all the details going well together even exposed brick wall and columns. WELL DONE! I thought the columns were the whole POINT of picking this house too! This turned out SO AMAZING. I can’t believe this only took 3 days. What couldn’t you guys accomplish together in a week?! Daniel, your blog is always so funny and inspirational at the same time! One thing though: can it say “Ionic”? I’m embarrassed. This is how I know I’m getting old, I think? My girls have this little thing they do with their hands. Doric is simple and square, thumbs curl up for Ionic, fingers splay upward and wiggle for Corinthian. Can’t see how to post a video of this but it’s very entertaining to us classical architecture goons. I teach the column orders in my ancient history class. Doric are the simplest and the word Doric sounds like “dork.” Ionic looks like its got “eyes on it.” And Corinthian has the fanciest name and it is the fanciest capital! Daniel, Although previously noted, I really appreciate your clarifying the countertop situation. The moment I read what it was, I remembered your experience, and thought about how pine being a soft wood, would not hold up for very long. 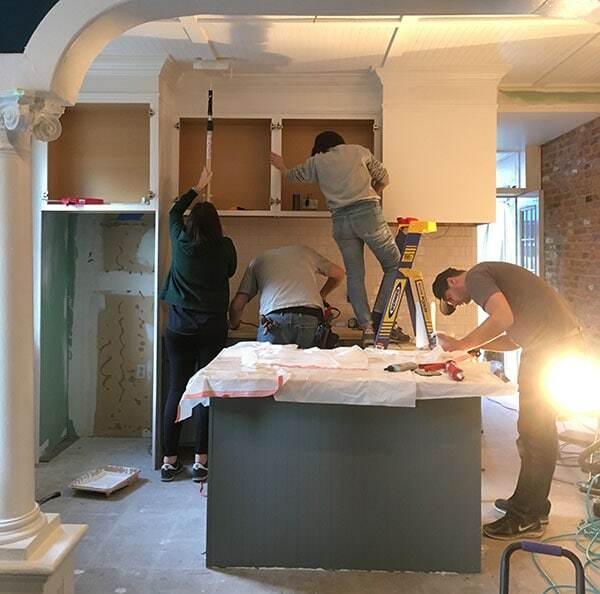 The kitchen looks terrific! I am generally not a fan of the mdf “beadboard” but you all pulled it out nicely. I am familiar with pre-primed 1×4’s and they are very helpful. I also appreciate how beautiful the filler trim-work above the cabinets turned out. I know this is picky, but it would have been nice if the underside of the uppers were painted white to hide the “wood” finish. I’ll admit, it is one of those things that always stands out to me (just like when refrigerator doors are hinged on the wrong side). Thank you, Devyn! Yeah, I typically try to avoid MDF and I prefer unprimed boards for my own projects, since the pre-primed ones are really much shorter lengths finger-jointed together, and I’d rather take the extra time for a solid board. But in this case, they were both absolutely the right call for time and cost-savings, and I legitimately do love the ceiling even though the idea came mostly out of the need for practicality, speed, and low cost! Thank you, on behalf of all that is historically just and also my Type A, for preserving the columns and not half-assing that window! Is it possible that the wall niche was for a fold-out ironing board rather than a window? Omg, it is beautiful! I read all stories and yours is the best recap! I think the counters are a great idea.. some of us can not buy everything right away but need an update..I am always surprised when people always get the most expensive choice. My taste can change.. every update doesn’t have to last forever.. I think the kitchen is stunning! And your story is riveting! At least informative and funny.. It looks wonderful. 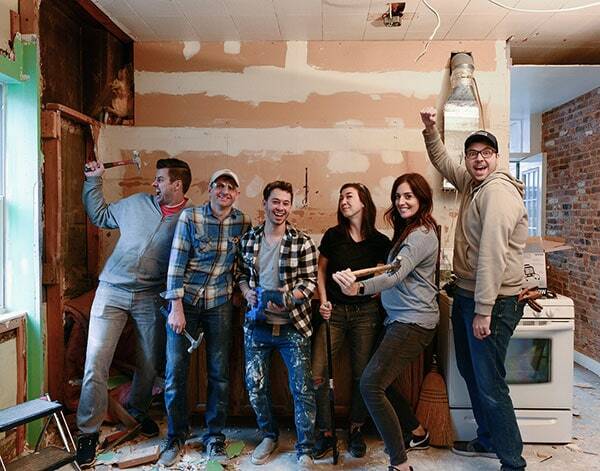 So much work, so many details plus 6 expert DIY’ers. I am starting to understand why not too much gets done around my house. I love the columns, but what do you think inspired the original builders to add them in the first place? Does it reflect the outside of the house at all–or the neighborhood? Love and and especially loved reading the other two points of view on the project. (yours was by far the best, of course). Thank god you saved the columns. I have a question about the dishwasher in the island…..how did you get water and a drain line to it? is it a portable unit that attaches to the sink? I agree with the above folks who said yours is the best writeup of the three – I love the unfolding drama of the uncovered surprises and negotiated compromises while working with a group – no one else shared that storyline aspect or so effectively communicated how much work and creativity this took (and fun!). I realize it’s nitpicking but I would have loved it if the beadboard ceiling framework was centered on that archway instead of asymmetrical. Probably anyone who mentioned that idea would really have been murdered though, given the time pressure. The dishwasher was kind of a head-scratcher! Luckily this is on the ground level and the basement was unfinished, so accessing water and waste lines was easy. We broke the hot line, tied in with new pex, and ran that the 5′ or so to the new dishwasher location under the floor. Tying into the waste was a bit more challenging, but most of it had already been replaced with PVC over the years so it wasn’t too difficult to tie into the existing waste line and add an air admittance valve to vent it and prevent back-up. We used SharkBite (aka push-fittings) to make our connections and add shut-off valves and stuff, which are perfect for smaller projects like this and pretty fool proof! OK. Your account is, by far, my favorite. 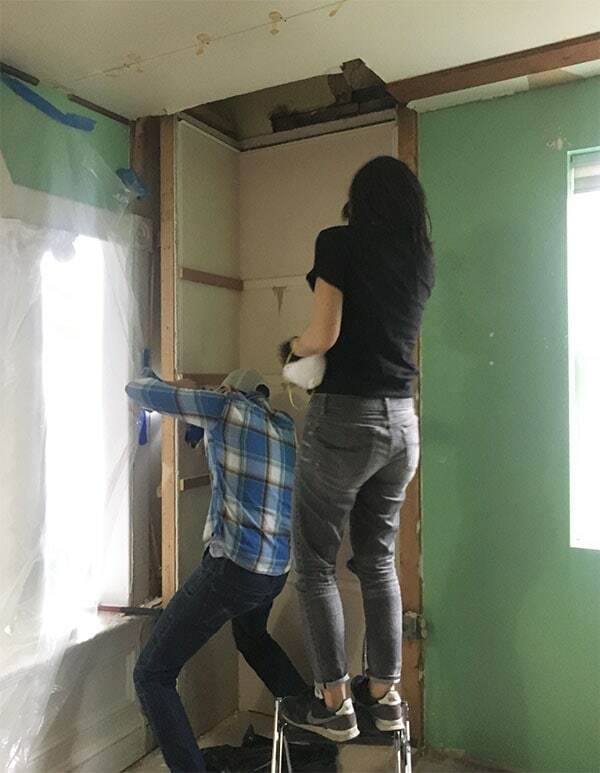 I could totally relate to your point of view the entire time – when we renovate, I’m always the person that’s like, “Yes, it’s not the most convenient, BUT IT’S THE RIGHT THING TO DO!” That’s my rationale behind everything. 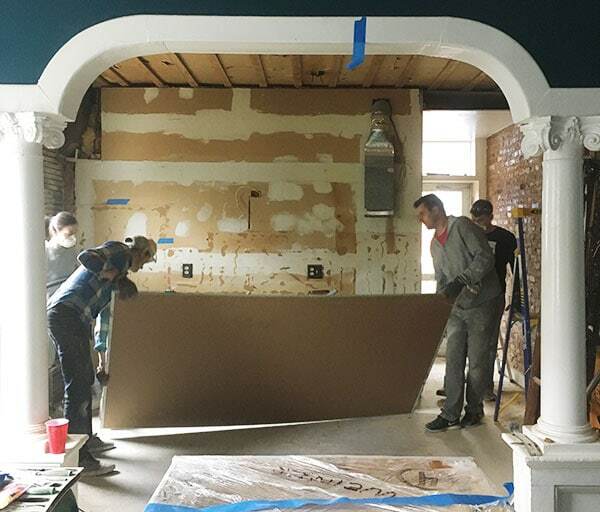 I realize it’s beyond the scope of the project, but I would’ve loved to see how the kitchen fits in with the overall style of the house, especially what I assume is the living room right next to it. I don’t believe a kitchen would be open to another room in 1900, there would have been a swinging door to the dining room, so I believe this was not the original kitchen. Might it have been the dining room? Then where was the original kitchen? Otherwise, the columns and the other detailing might not be original, although they look original to me. I can’t imagine adding the large opening and the columns, decreasing storage space along that wall. Agreed, I doubt this room was the original kitchen! The original room would have also been somewhat bigger—the wall that the stove and fridge and stuff is on was added later to create a full bathroom back there. 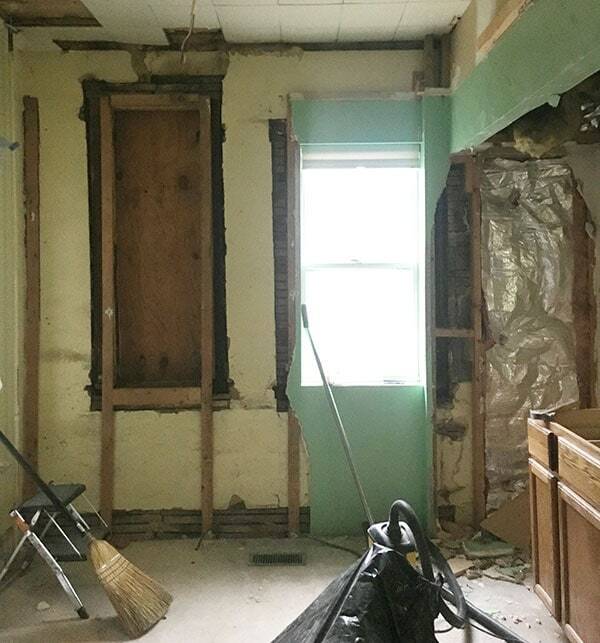 I think an original kitchen might have been either in the basement (which is now unfinished, but the joists are riddled with lath nails suggesting that it was originally—or at least at one time, pre-drywall—a finished space. Otherwise I think it’s actually somewhat common for kitchens to have been on the second floor, with the ground level reserved for formal spaces. I’ve seen a couple of larger Brooklyn brownstones arranged that way, but I’m not sure how common it would have been in a more modest Baltimore rowhouse. What an awesome job, and it sounds like an amazing experience! And such a stunning transformation! YAY TEAMWORK! OMG those columns. Thank god you were there to save them! 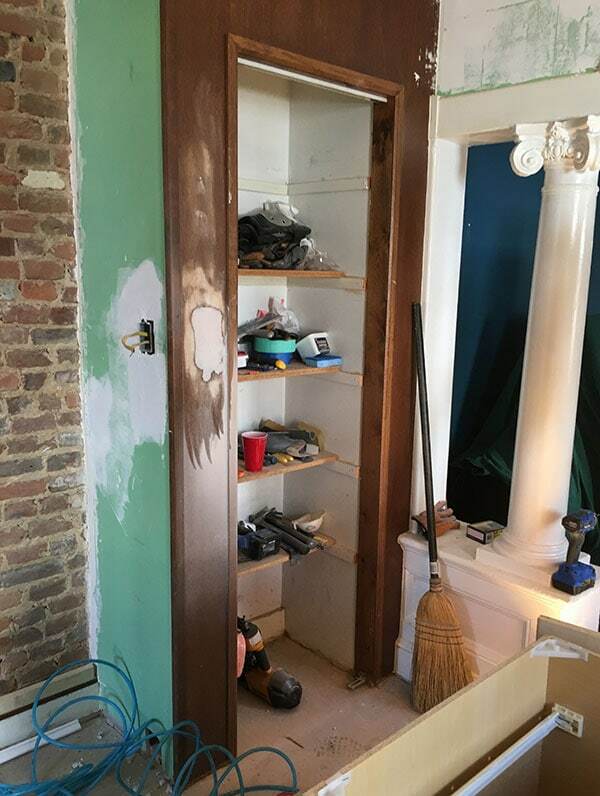 When we renovated our 1925 double living room the original arch was boxed in with bad 1980s panelling and we found indications of the original bottom boxes under the panelling but the columns were long gone. If only we we had those columns! Loved everything about this post! Fascinating, and you’re hilarious! The ceiling transformation is my favorite. The old ceiling blocked the view of the transom above the back door. Now the hall looks like part of the kitchen. And the ceiling has great detail without being overwhelming. Is it just the perspective or are the upper cabinets really high up. I’m 5’4″ and figure I’d be hauling a step stool every time I needed something. And what happens if they have to replace the frig and can’t find one that fits the opening. But’s it beautiful. My next favorite part is the coffee station. Great storage in a small space. I don’t usually like these makeovers but with your detailed behind the scenes explanations I feel that it wasn’t slapped together just for the camera, only to all fall apart after the crew leaves. Raising the ceiling made a huge difference! So much brighter and grander. The hall ceiling would ideally have been raised to the same height (always an option should they choose!) but that fell a little outside our scope. It’s not your perspective—the open shelf above the sink is about the height of where a standard upper cabinet’s bottom would fall, so the uppers are mounted about a foot above normal height. You’d be OK reaching stuff on the bottom shelf, but definitely need some extra height for anything above that. Organized properly, though, I think that’s actually OK since less frequently used items can be stored there. Replacing the fridge (which hopefully wouldn’t happen for a very long time!) shouldn’t be that big of a deal…this is a totally standard size, but they have a few inches of play to the left with that filler piece. The height would be more of a challenge. Maybe the homeowners will take care of the hall ceiling but it already makes a difference. Good work, Daniel! It looks so good. The ceiling! And the columns. I’m so glad you persuaded the owners to keep them. It’s surprising the difference between the old high gloss finish of the columns and the new satin finish. They look so much better. How did you get on with so many working in a comparatively short space at one time? A lot of: “excuse me… mind your backs, coming through”? And, given your own kitchen plans, what did you think of the sink against the wall with the shelf above it? I love it when people I like on the internet like each other in real life. I already knew that Kim is an unbelievable sweetheart (I bought prints from her print shop, and Canada post lost my order, and she was the very very very very best about it and someday I will own more of her work!) but…it just makes me so happy that you all got along doing something so stressful. And the kitchen is gorgeous. Wow! What a difference. They are so lucky to have had you all. It all looks great, but I think the ceiling solution was my favorite part. It was an unexpected problem that ended up making the whole room more beautiful. Great job! Ahhhhh you guys (and door sixteen) are MY dream team! I will say I also thought the columns were awful but now they look like they were meant to be there. You guys have such vision. Haha! It WOULD be a good excuse to all be back in the same place together! 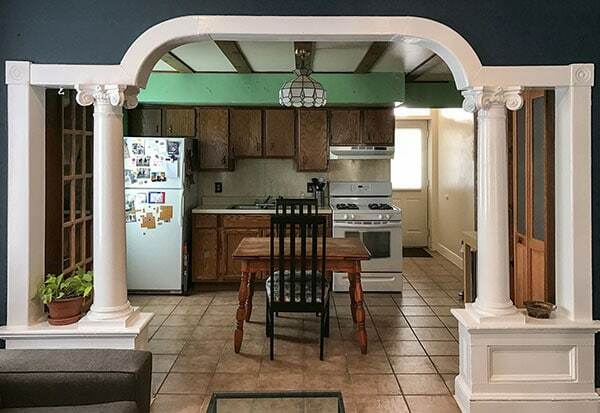 Well, if the homeowners have you to thank for keeping their columns, raising the ceiling, and matching the window trim to the columns trim AND getting a windowsill, I’d say it was a really good thing you were there! Having lived in old houses, it is clear to me that people who don’t often don’t know what they are looking at, and do the damnest things to old houses. I’d be really curious to know, by looking at other neighborhood homes, whether the columns were actually original (row houses in neighborhoods were usually built with similar interiors, so it is pretty easy to figure out from a few house tours and scanning some real estate listings. Even if they were a long ago addition (which I suspect), I’m glad they were kept – I didn’t like them in the original photos, and I’m glad they now look like they belong there with the new kitchen. 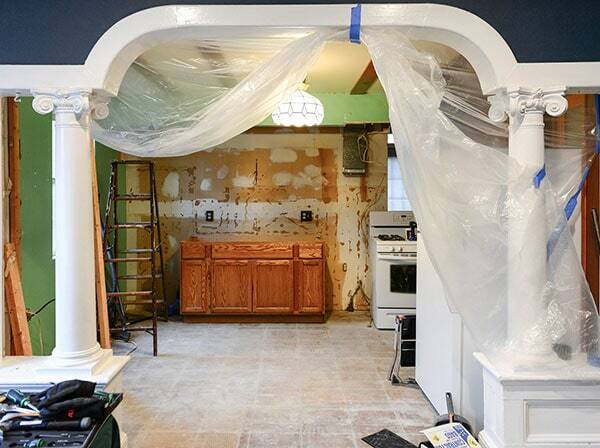 I’m surprised you didn’t insist they demolish the second pantry as well, to show off the archway and moldings on both side, and for balance – I don’t like it there at all. I think a freestanding piece of furniture, even if basic, say with some doors on the bottom and glass paned doors on the top would look great on that wall, and hold just as much, and do while looking beautiful. I usually don’t like exposed brick in residences, but since this is out of the way, basically on the way to the back door, I like it fine here. I know you would have done drywall or real wood on the ceiling, but I think for something you can’t look up close, this budget option works just fine here and looks good from where you can view it from average height. I don’t think the countertops do though – whether it was the artificial short time or limited spending amount that caused it, I’d also rather see butcher block here (even Ikea) or even a nice formica (which I don’t hate) than these pine boards. You’re right, though, they can change them – but I hate short-term solutions. 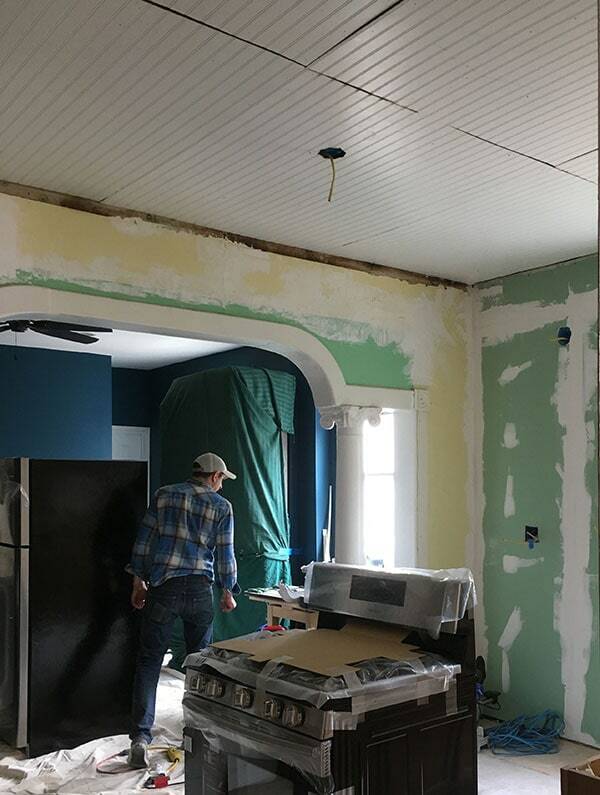 I’m curious why the need for crown molding above the cabinets – I’d have thought you’d have wanted the more simple 1 x 4 treatment around the room for consistency. And what, if anything, is in that box of lowered ceiling in front of the back door, and why wan’t it removed for a consistent ceiling height? Amazing job really, and I’m glad you had fun with each other, even if it does sound like a killing pace. I like the crown above the cabinets—particularly because we added filler to bring them up to ceiling height, I think the chunkier molding treatment keeps the filler from looking disproportionately large, if that makes sense. I didn’t have the final say on that stuff, though—I’d just call out suggestions until something stuck! I do think it’s a very nice detail, though, and that particular crown profile is really pretty—I’m actually glad to know Lowe’s carries it, since stock molding options are often so blah. I don’t think anything’s in the ceiling in front of the back door, but it was primarily a time issue. Ideally it would have been removed too, but that’s always an option now that the bulk of the work has been completed. I’m guessing you were also itching to replace the removed window, if more time were there, and restore the height to the existing one, which looks like the top was shortened to go with the lowered ceiling treatment. The more windows in a kitchen, the better, as I like cooking and cleaning up in natural light whenever possible. I like tall windows, and would have left them to original length if I redid them. You’d probably have shorted them at the bottom so as to be above counter height as in your house – I like tall windows (too many years of brownstone living) and have no problem with seeing counters running in front of windows that go lower behind them – I’ve seen that look a lot in old houses. I like how all the upper cabinets are all aligned (though I could never reach anything in any of them without a ladder.) 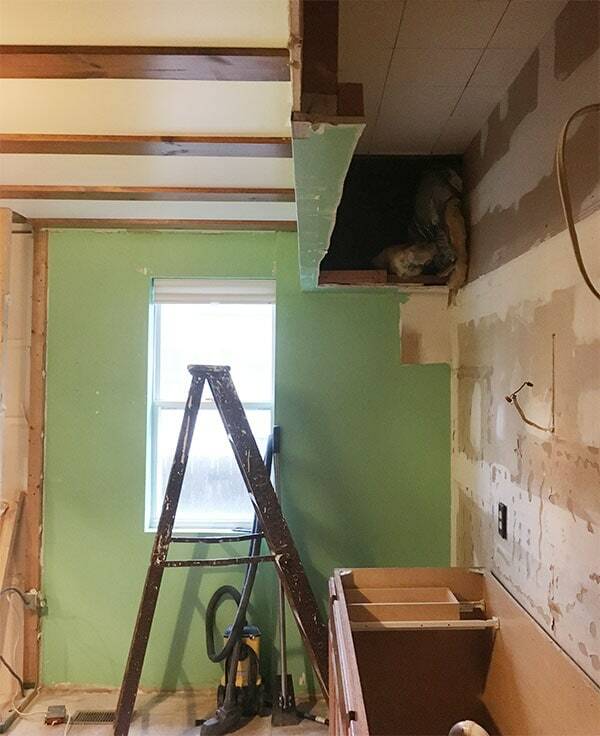 Why wasn’t the plywood box over the vent aligned with the cabinets – was it a choice, or just dictated by where the vent had to connect? Also, as I’m insanely curious about old homes, what was the pipe or chase in the corner above the refrigerator for? 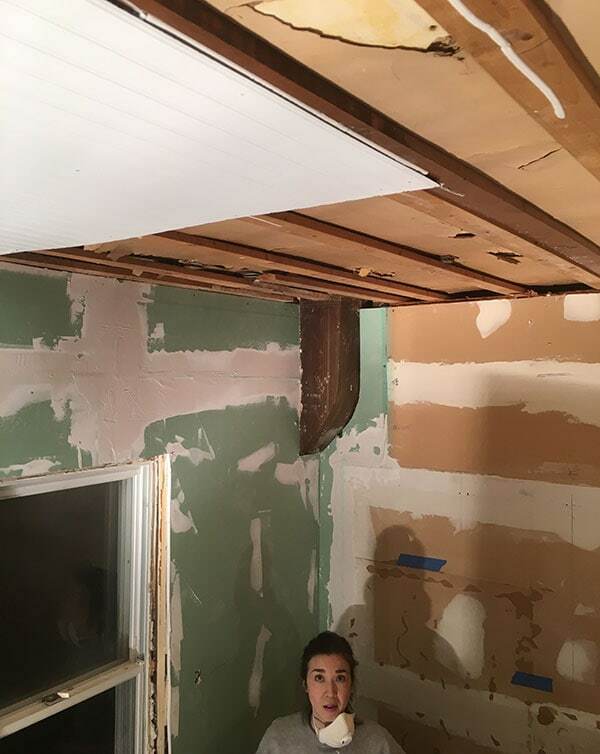 Do you think someone lowered the ceiling just to hide it at some point (obviously before someone else installed a cabinet over the fridge that would have hidden it as you guy did. Since this is a brick house and that removed window had been (seamlessly!) bricked over at some point on the exterior, trying to change that was just definitelyyyyy not an option at least for this. Even if it were my own house, that would be a tough trigger to pull! 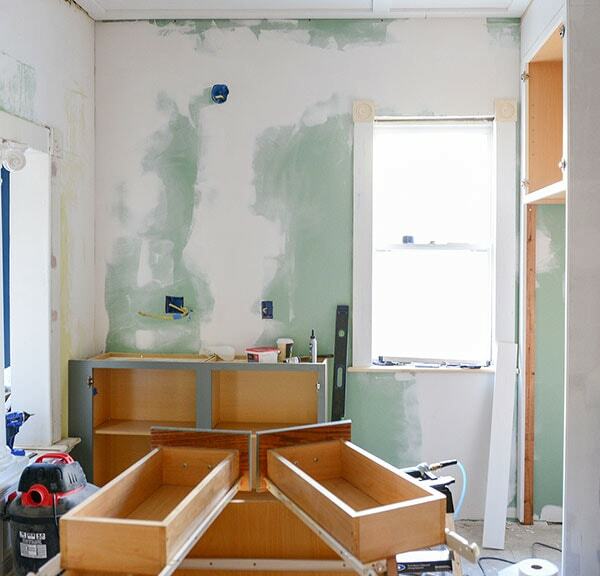 I will say the kitchen is VERY bright now, so it really doesn’t feel like it’s lacking a window that ought to be there. I don’t know about the vent cover! None of us could figure out quite what that curved chase thing was for! it seemed to be plastered over brick, but we didn’t do a lot of investigation since it was solid and, yes, would get covered. 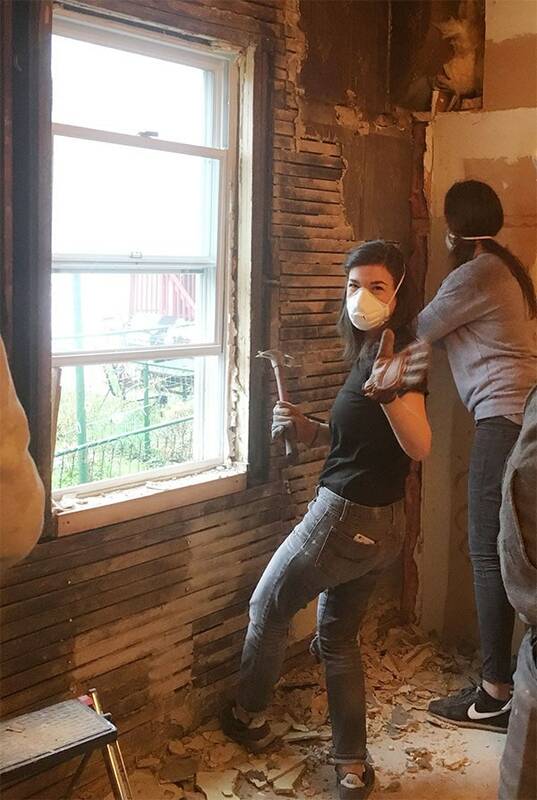 I didn’t think about how much harder it must be to add a window to a bricked-up space – you made it look so easy on you clapboard house! What a beautiful end product – and the ceiling is EPIC. Also, it sounds like so much fun – exhausting etc. – but fun. This space turned out so well. It may have been a bit stressful but at least you have a great story to tell from it and man do I love reading your blog. Always telling it as it is, my favorite! Wonderful redo and wonderful post! That kitchen is absolutely lovely, now. The ceiling is inspired! Perfect solution. I really like the color of the floors, as well. And your writeup had me laughing out loud several times, as per the uzh! I’m surprised you haven’t gotten more comments. This was a fantastic post! ← The Bedroom is…a Bedroom!